This user's DS friend code for Pokémon Diamond is 3952 3567 4544. Preferred battle tactics: Psychic, Dark, and Ghost type Pokémon, dabbling somewhat in Poison types. Description: He is a slightly short, thin male, with short brown hair and brown eyes, framed by rectangular glasses. He has a tattoo of a white rabbit on his left shoulder blade, and a tattoo of a strange eye on his left arm. Lan's first encounter with Pokémon began when he was 6 years old. He lived in Eterna City his whole life, and was a rather introverted child. He was playing near not far from the city one day, and got lost in the Eterna forest. He ended up near the Old Chateau, and wandered inside to look for directions. A Gastly appeared in front of him, in a menacing way. They stared at each other for a moment, then both made a funny face at the same time. Both Lan and Gastly laughed about it and played in the chateau for the rest of the day. On a trip with his family to Jubilife City, when he was about 8 years old, he wandered off playing, and ended up in some tall grass outside of Jubilife. It was turning dark, and Lan wasn't familiar with the area. He was near a cave, completely lost. He noticed an Abra, and it teleported him right to his hotel room, which startled his parents. These experiences got rid of most of Lan's fear of the unknown, as it showed him that even things that seem scary usually aren't when you look closer. He decided to not become a trainer until he was 18, instead studying Pokémon battles since he was 10. Because of this, he has a vast knowledge in many areas of the Pokémon world. When he was 18, he met a trainer named TJ in Kanto, where Lan was doing some studying. 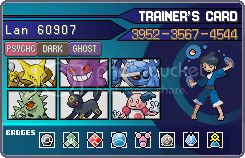 TJ was a master trainer, and had been working with Pokémon for over a decade. TJ was a quick learner, and a natural battler. He taught Lan everything he knew, and eventually decided to give up battling and instead become a Pokémon researcher. TJ gave Lan all of his Pokémon and rare items. This included many legendary Pokémon that TJ had encountered throughout his long history as a trainer. He has been training with psychic, dark, and ghost Pokémon ever since, and he understands his Pokémon exceptionally well, almost to the point of being able to speak with them, making him a formidable opponent. He is very smart, and has a natural knack for battling. He also researches Pokémon when he's not battling, and all of his knowledge makes him an even tougher opponent. He usually keeps to himself, preferring to focus on his studies and his Pokémon, but has several close friends. Lan challenged the Sinnoh division of the Pokémon league, and did remarkably well.